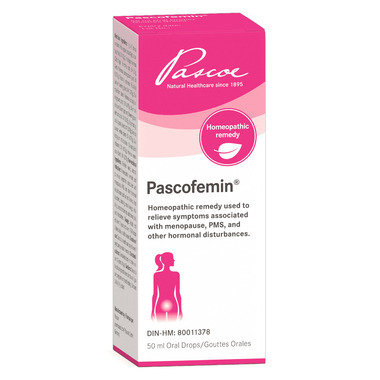 Pascoe Pascofemin Drops are a homeopathic remedy used to relieve symptoms associated with menopause, PMS, and other hormonal disturbances such as hot flashes, sleep disorders, bloating, mood swings, irritability, breast tenderness, abdominal pain, and headaches. Directions: Adults and children ≥ 12 years: 10-30 drops 3 times daily in a little water. Caution: Consult health care practitioner before use if pregnant or breastfeeding. Contraindicated in children under 12 years of age.